The 2017 results of TennesseeCAN’s annual survey of school leaders from across the state shed important insight on top education issues. Following this week’s earlier release of results of a statewide survey of district leaders, today TennesseeCAN released the 2017 results of a statewide survey of K-12 school principals, painting a clear picture of school leaders’ perspectives on school- and classroom-level factors affecting student success. Having a high-quality teacher is the most important in-school factor in determining a student’s academic success. Research shows that a student can lose more than seven months of learning when stuck in an ineffective classroom for two consecutive years – and may never catch up to their peers after three consecutive years. Luckily, 77% of school leaders consider the effectiveness of the teacher/classroom the student had the previous year when assigning students to classrooms for the upcoming school year, but 16% do not consider it at all. While a majority of school leaders (80%) consider the student’s individual achievement levels from the previous year, 14% do not. Policies to consider these factors in student placement strategies may help boost academic success. Increased instructional time is another area where school leaders provided interesting insight. A majority of principals (63%) believe teachers and schools do not have enough time in the school day to meet the needs of students, and 53% believe there is not enough time in the school year. Also, a majority (59%) would support an extended school day or school year if given the necessary resources and state support. This year, TennesseeCAN saw record participation of principals—an increase of nearly 7% from 2016. Surveys were administered in late July/early August 2017 via emailed survey to all current Tennessee Directors of Schools. 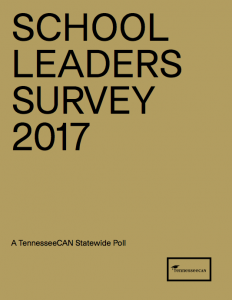 Full survey results are posted on the TennesseeCAN website: https://tn-can.org/research-showcase/school-leader-survey-results-2017/.